For other locations with the same name, see Hranice (disambiguation). Hranice (Czech pronunciation: [ˈɦraɲɪtsɛ]; German: Weißkirchen or Mährisch Weißkirchen , Romanian: Hranițe) is a town in Moravia, the eastern Czech Republic. It is sometimes informally called Hranice na Moravě (literally, "Hranice in Moravia"), to distinguish from other places with the same name, Hranice. In fact, Hranice na Moravě ([ˈɦraɲɪtsɛ ˈna moravjɛ]), is the name of one of the railway stations of the town, the other being "Hranice na Moravě město". The deepest pit cave in the Czech Republic, Hranice Abyss is located by the town. 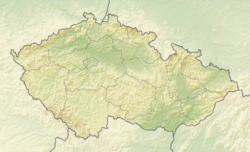 Until 1918, Hranice was part of the Austrian monarchy (Austria side after the compromise of 1867), in the district with the same name, one of the 34 Bezirkshauptmannschaften in Moravia. The German name only was used before 1867 (including Weiskirchen). In 1883, Antonín Kunz (1859–1910) founded a company in Hranice for the repair and production of small farm machinery and then specialized in the production of windpumps and other pumps. The company became the largest factory for water pumps in Austria-Hungary. At the end of the 19th century, it also produced complete communal water systems (by 1912 it had done so for 1,056 towns and municipalities, as well as factories and large landowners). The Sigma Pumps company developed out of Kunz's company. In the days of Austria-Hungary, in the interbellum Czechoslovakia, and during the communist era the city hosted a large military academy. Notable graduates include Archduke Wilhelm of Austria and Herman Potočnik. The first Jews came at the beginning of the 17th century, receiving in 1637 the right for a self-governed Jewish quarter, around the present Janáčkova street (renamed from Židovská street). Besides those 17 houses, they were not allowed to purchase houses elsewhere. The community reached a high 802 people in 1857 (13% of the entire town). They had a significant role in the development of Hranice's industry: a textile plant established in 1844 (the largest factory until the mid-20th century), and distilleries (1827, 1836). The Confusions of Young Törless a novel based on experience in the Hranice military academy. ^ Bartoš, Josef. 1978. Historický místopis Moravy a Slezska v letech 1848-1960: Okresy Přerov, Hranice, Kroměříž, vol. 6. Ostrava: Profil, p. 130. ^ a b Snyder, Timothy. The Red Prince: The Secret Lives of a Habsburg Archduke. Basic Books, 2010. ISBN 0465018971. Retrieved 7 November 2013. ^ White, Lewis M. On all fronts: Czechs and Slovaks in World War II. East European Monographs, 2000. Retrieved 7 November 2013. Wikimedia Commons has media related to Hranice (Přerov District). This page was last edited on 7 February 2019, at 06:58 (UTC).